It's the biggest in the series. 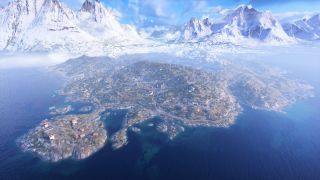 Battlefield 5's Firestorm battle royale mode, which was announced last week, takes place on the largest map in the series. Halvøy isn't just massive; it's a whopping ten times larger than Hamada, previously the largest map in Battlefield 5. Check out the size comparison below. Battle royale maps are typically large, of course, but the immense size is even more necessary given that Firestorm features helicopters, as well as lots of other vehicles. It will launch with 17 of them, including a tractor, though don't expect to get around quickly in that. You'll be able explore it when Firestorm launches for all Battlefield 5 players on March 25.